It’s Valentine’s Day! 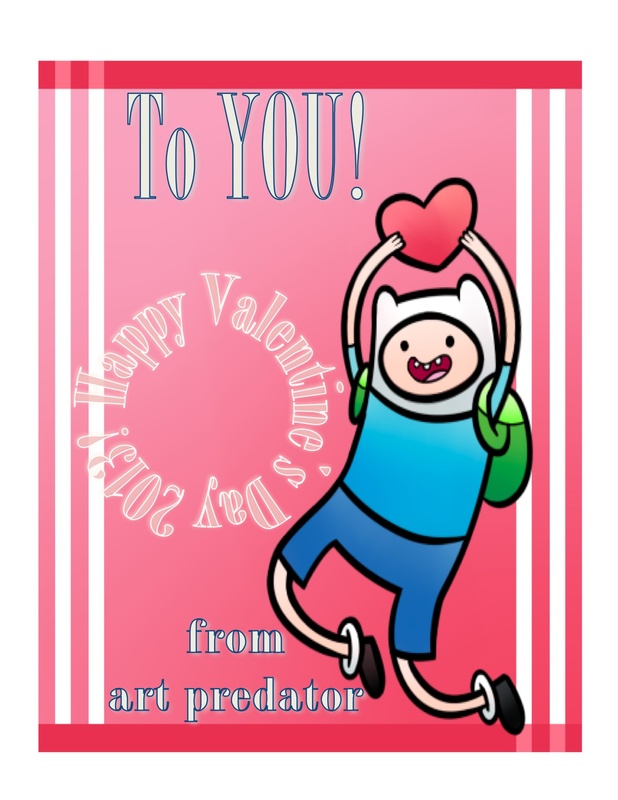 My 9-year-old and I found Adventure Time artwork and added the text for his valentine’s day cards then I changed it to be from me aka Art Predator! To encourage my students to make it to class today, we’re having a small party with food (Shh, don’t tell! ), we’ll do some writing practice, and, well, there’s an in-class writing activity too called an in class essay exam. Here’s ideas on how to ace an in-class essay exam–and what your teachers are really looking for! PS Can you help ME go on an adventure? Just vote here for me to go to Chile where I will blog my heart out for you! I don’t know if this is a “true” story, or based on one, but the point about how we use our words, and how our words convey our thoughts and ideas is the truth. How we convey our ideas, our message, is as important as the ideas themselves. As writers, we have many choices. For me as a writer, I struggle and I revel in those choices. As a writing teaching, sharing those choices is both a challenge and a joy. I’m not trying to change my students writing, change what they have to say, but to show them that there are other ways to express their ideas that will be more moving, more transformative for their audience…and for themselves. Actually there is nothing wrong with the picture–but there is a lot wrong with the text! What do you think this gallery is trying to say? How would YOU revise this text? Please comment and leave a link to your blog! Only 15 days left to apply…. This semester, as in many terms past, my students are learning how to blog. Yes, they each have a blog on a topic of their choice where they can post writing on topics that they choose as well as select assignments from me which they can delete after the semester is over. They are required to have an about page that introduces the writer to the reader as well as the conceit of the blog. They are encouraged to create a gravatar and to have a tagline. So far, many of the students LOVE blogging! Yes, they are finding they love to write if it’s on a topic of their own choice and where they can express themselves in creative ways. Yay! In fact some of the students have already created a second blog on another topic! In the coming weeks, students will be creating a group blog related to an issue raised by their book club book. They will use their blog in their presentation to the class about the issue—using the blog to store and organize their presentation. They can use the blog to post videos, interviews, powerpoints, slides, and other information that they want to share with the class. This way, we can all go back to their blog to learn more about their topic—and what they learn is also available as an online resource for others. How can students become betters learners? Writers? Thinkers? The success of a writing across the curriculum program in Staten Island indicates that writing, writing frequently, and writing about challenging topics leads to improved test scores. As a college teacher, instead of giving quizzes to show that students completed the required reading, I have my students write 2-3 page reading responses about what they read: They must summarize, analyze, and respond with their own opinion; they must include quotes about the readings to support their ideas. The students then read and respond to each other’s brief essays, then I do. Over the course of a semester, they compose (and I read!) 20 or more of these 2-3 page papers. As much as the students complain about them, they also give credit to these assignments for helping them to learn how to read, write, and think critically. Each class we tackle a new element of how to write these (from citing sources to writing a thesis) while they are grappling with conveying their ideas in writing. Teacher surveys conducted by Arthur Applebee, the director of the Center on English Learning and Achievement at the University at Albany (part of the State University of New York system), found that even when writing instruction is offered, the teacher mostly does the composing and students fill in the blanks. Rachel Carson’s landmark book Silent Spring turns 50 this fall (read an except here of the chapter “The Obligation to Endure”). The Rachel Carson Center for Environment and Society just launch its blog, Seeing the Forest: http://seeingtheforest.org/ to demonstrate the relevancy and importance of humanistic and historical perspectives in discussions about today’s environmental challenges. long and complex relationship between humans and nature, and serves as a resource and forum for those invested in and curious about the environmental humanities. The blog welcomes contributions from scholars, students and professionals in the environmental humanities field. Norman Rockwell? Or Norman Bates? 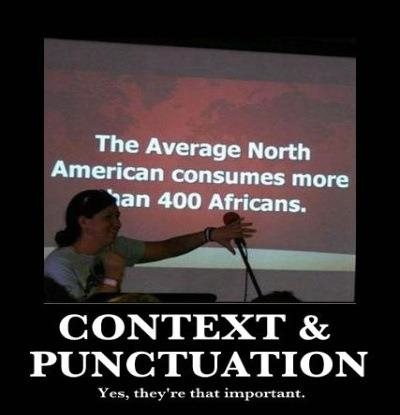 Have a Happy Punctuation Day! Are you an average North American? How many Africans do you consume? And how would you make it right? For more examples, check out Grammarly on Facebook–that’s where I found this one. And to see what’s wrong with your text, check out Grammarly’s website. Today is Tuesday, September 11, 2012. On Tuesday, September 11, 2001, I wanted to get some painting done on my house before I headed midday to the college where I was teaching. I called my dad, an early bird, and asked him if he wanted to come over and help. He declined, saying he had some other projects to work on. Then he called me right back with the news about 9/11–and said he’d be right over to help me paint. School was cancelled the next day, and again I spent it painting; it was calming to do something outside, normal, physical. I didn’t watch any of the news footage but listened on the radio for more news. Once that I heard that twin sisters, close friends of mine since 7th grade, who worked for United and American often flying from their home base in NYC to LA, weren’t on those flights, I was greatly relieved. I know many people lost loved ones that day. It changed us all. I wrote this poem the morning school was back in session as I tried to negotiate going back to “normal” life. What are your 9/11 memories? How did that day change you? 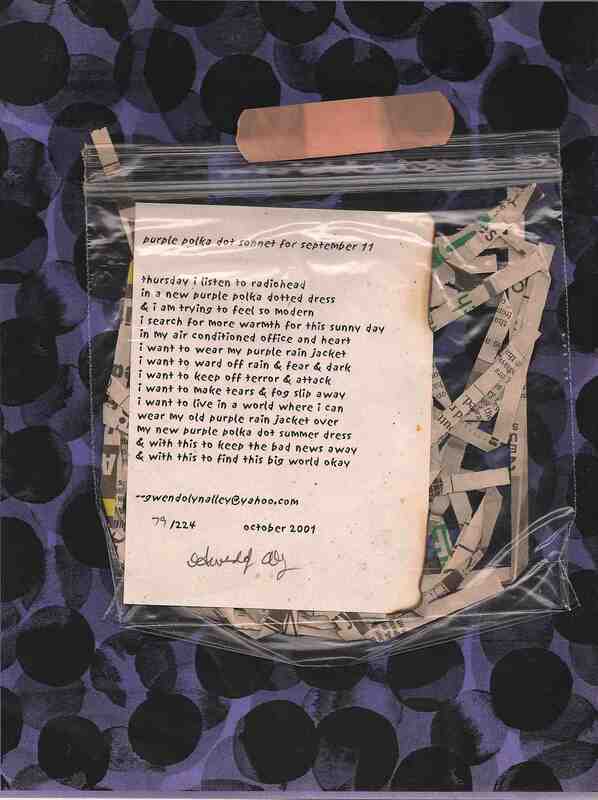 The “Sonnet for September 11” was published October 2001 in ArtLife. Read the text of the poem here and learn more about it. If you’re interested in learning more about me, here’s an article from the August 25 VC Reporter by Michel Cicero. In March 2011, en theos press published my 3:15 experiment poetry collection Middle of the Night Poems from Daughter to Mother :: Mother to Son,in print and ebook; it’s also at Amazon.com, and in stores including The Best of VC Marketplace in Santa Paula where I will be signing books Thurs. Sept. 29.